Tastefully decorated, modern, 2 bedroom apartment with 1 bathroom, separate toilet, fully equipped American kitchen and large living room that leads on to a large terrace with sea view. 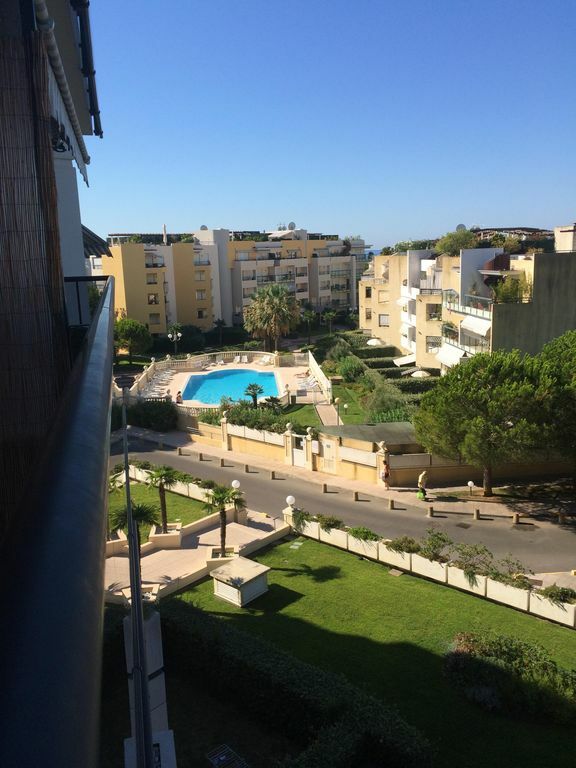 It is situated on the fourth floor of a prestigious building, accessed by lift in a secure, built complex (2006), with swimming pool and 2 mins walk from beach, shops and restaurants. There is a master bedroom with double bed and fitted wardrobes, a second bedroom with bunk beds and fitted wardrobe, both bedrooms lead on to a rear balcony with mountain view. There is air-conditioning and central heating. The bedrooms have wooden floors, the hall and living room have marble floors. Ideally suited for 4 but could sleep 6 (with 2 children) as there are 2 sofa beds in the living room. The San Marco swimming pool is child secure. A private underpass leads straight from the garden to the beach. Cagnes-sur-Mer lies between Nice and Antibes and Transport links are excellent. Within walking distance: tennis in town; children sports and leisure centre on the beach (St-Laurent-du-Var); water sports including a Sailing School within walking distance. Scuba Diving Centres are within a 5 minute drive. Golf & Horse riding within a 20 mins drive. Fishing, Cycling, Jogging along the Seafront (300m away). Walking holidays, Rural / countryside retreats, beach relaxation, a winter ski/sun break and City breaks (e.g. Events in Cannes, Nice or Monaco). Owner: This apartment is very well looked after as it is also regularly used by the owner and his family. Area: Brand new Shopping Center Polygone Riviera with shops, restaurants, cinema (14 mins drive). Other big shopping center CAP 3000 with Gallerie Lafayette at a 10 minute drive. Supermarkets in walking distance or 5 mins drive: Casino Géant in Villeneuve-Loubet. Cros-de-Cagnes village market every Tuesday and Thursday - 5 mins walking distance. The quality of the restaurants in the Area and specifically in Cagnes-sur-Mer is very good. Your culinary experience can only be improved by a trip and meal across the border to Italy (Ventimiglia and Bordighera) - 35 to 45 mins drive or by train - after having been shopping in the local street markets. Transformable living room table into dining table. The front terrace with seaview easily accommodates a table and 6 chairs plus 2 sun-loungers. All Windows are protected by electric blinds. Cleaning of the appartment after your stay is included in the rental price. Smoking is permitted on the balconies but not in the apartment. Children are more than welcome, but no pets! From the Italian Riviera and its famous markets (Ventimiglia, Bordighera) in the east to St. Tropez in the west, the Côte d'Azur is full of famous coastal resorts: Menton, Monaco, St. Jean Cap Ferrat, Nice, Antibes, Cannes, St. Raphael, St. Tropez, are all within easy travelling distance. The Inland towns and villages of Grasse, St Paul de Vence, Mougins and the Gorges du Verdon as well as the Parc National du Mercantour provide spectacular access to the southern Alps. Cagnes-sur-Mer is a little jewel on the coast and comprises three main areas:- the old fishing port of Cros-de-Cagnes, with shops and restaurants within an easy walk of the apartment, the town centre, and the ancient village of Haut-de-Cagnes, with its castle and steep narrow streets. The race-course (Hippodrome de la Côte d'Azur), lies at the far end of the newly laid-out promenades along the sea front.